Time to say farewell until next season, Faithful Reader! We are sitting in a hotel in Fort Lauderdale, eating Publix shrimp and drinking cheap wine. Grenada to Vancouver is a long way - especially when you have Glen for a travel agent. We flew last night to Trinidad (we know, wrong direction) and spent part of our 11 hour layover in an airport hotel. Today we flew from Trinidad to Miami - and wonder of wonders - we didn't spend 2 hours in the Immigration line-up. We were through in minutes and rushed out to our rental car to carry us to our Fort Lauderdale hotel. Tomorrow, we fly at 6:02 AM (Ugh - can you believe that?) and we will be at YVR by noon. But great to get home. So excited to see our little grandbabies/preschooler! We loved our season this year - we got to use so many of the courtesy flags that Pam sewed over last summer. BVI, St. Martin, St. Barts (French), St. Kitts and Nevis, Antigua, Guadeloupe (French again), Dominica, Martinique (French again), St. Lucia, St. Vincent and the Grenadines and Grenada. We spent time with wonderful people - locals and fellow cruisers. Saw some amazing places... and left some tantalizing spots for next year. And now it's time to go home and enjoy the good life we live there with all of our wonderful family and friends. Ciao - until next fall/winter! Blue Pearl is resting in a new spot for a few months. The folks at Grenada Marine have been very friendly and we feel we are in good hands. We worked hard yesterday, getting the chores done that we could - scrubbed the bottom, packed up stuff, cleaned the dinghy and a few little things - all in 30+ C temperatures, high humidity and no breeze. We were pretty happy to get picked up by someone from our hotel so we could clean up and cool off. La Sagesse is a boutique hotel and they cater to folks who are transitioning on or off their boats. We've already had a couple of meals with Peter and Anne from Spice of Life as they get ready to head back to Canada. We did the bottom today - lots of people scratching their heads saying we should do it just before we splash in the fall. However, we talked to the company who makes the paint and they said it makes no difference. Also, Gary told us that for years he has done his while the boat is clean from hauling and he is used to the heat - and he hasn't noticed any degradation in the protection. So now, while we have the time and are somewhat acclimated to this heat, we just did it. It probably didn't need much anyway. The paint was new at the beginning of this season and it looked like new so really all we did was to add another coat. One less thing to do before we splash in the fall. And after another coat of paint.... tada! Tomorrow we only have little things to finish up and decisions about what clothes need to come back. We almost got sick when we pulled out sweaters to have when we arrive in Vancouver. Ugly thinking about sweaters in this heat. Glen is objecting to the notion of shoes. We'll have to see how that goes. Otherwise we rest and enjoy La Sagesse. Thanks for that tip Bobby and Leslie! When we left you, Faithful Reader, we had stayed a couple days in Prickly Bay. It is close to Budget Marine for parts and supplies. Also we were able to take the bus into St. Georges for a quick look around. We've read so many blogs, and heard about so many places that it has been fun to finally experience these places ourselves. Clarks Court Bay is an interesting spot. You can dinghy to Hog Island and further into Mount Hartman Bay if you want. It is home to Clarks Court Bay Marina and Whisper Cove Marina... and within walking distance of a rum distillery. Whisper Cove hosts a Tuesday evening jam session and Glen has been able to determine that his singing and guitar playing gets better, the more he drinks. By the end of the evening last Tuesday he was positively Elvisque. Just around the corner at Calvigny Island sits an EXCLUSIVE resort - we're talking 30 thousand per night at the 10 bedroom resort. We were going to stay there for several nights but we couldn't fit it into our busy calendar. We had planned to pinch our pennies and stay at anchor until the last moment - then dash into Le Phare Bleu Marina for a couple of nights to stow things away and then head to St. Davids Bay for our haul at Grenada Marine. But for $35 per night it would have been $105 for 3 nights and a week was only $175. AND, the last marina we stayed at was at Nanny Cay in the BVI where we did our transition with Maria and Al. So... time to indulge. What a great place! The marina office is a decommissioned Swedish Lighthouse Boat. It serves as a gourmet restaurant, marina bathrooms and showers, a bar and a museum. How cool! The resort itself is a gem. We don't know what it costs to stay in the cottages but the pool bar/restaurant is lovely, breezy and they sell 2 dollar beers. We are charter members at the bar. We are doing little decommissioning jobs everyday - Glen is making sure he doesn't over-exert. Several boats in the marina recommended a young guy who provides great service cleaning and polishing for a very reasonable daily wage. We are hesitant to mention this. Several of our sailing buddies will see this as confirmation that we have gone really soft... and we have... But... we have hired him to do some of the waxing and polishing and so far we are very impressed. If you get here... make sure to check out Kenwin if you have waxing, polishing, varnishing, etc work. He works like a Trojan and the results are impressive. Really looking forward to seeing friends and family at home... and excited as we plan for our season down here next year. It was great to see Gary and Donna after all that time. Easy to see why we clicked with them so long ago and stayed in touch for 35 years. We are going to be storing the boat in Grenada this year and so we set out to get close to our haul-out spot in Saint David's Bay where Grenada Marine is located. 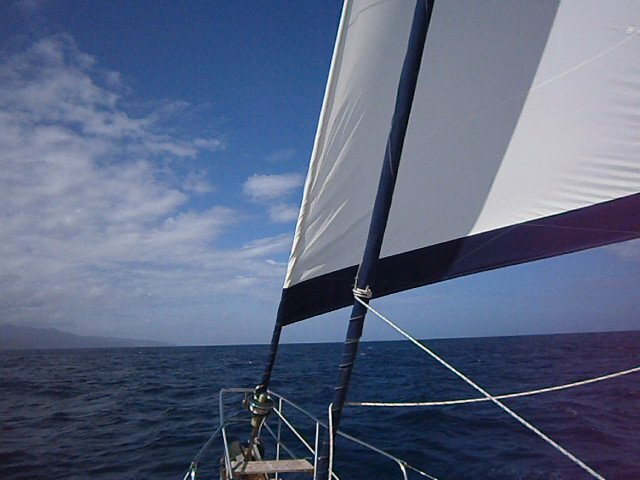 We are always surprised by the wind speeds so we set out with one reef in the main and a partially deployed jib. This might have been our best sail of the year. We were in 20-plus winds off the beam for the whole trip with gusts that made the trip exhilarating. We covered the 21 miles of open water between Carriacou and Grenada in 3 hours - 7 knots average - crazy! And other than a few choppy spots it was very comfortable. The currents were crazy - sweeping us west and then east - and we had to change our heading continually to keep on our path. We passed across "Kick Em Jenny" an active volcano about 600 feet below the surface. There hasn't been anything alarming in recent years so we crossed our fingers as we transited through the exclusion zone. As we got into the lee of the island the winds started to go weird so we motor-sailed the rest of the way around to Pricky Bay and anchored behind a small patch of coral for protection. We had a beery reunion with Chris and Linda from Troubadour and got the skinny on the local area from them. Lots of fun. We took the bus into St. Georges to find an Island Water World and explore the town. Bobby and Leslie from Gra'inne and Glenn and Sylvie from Gemma's Inspiration were at Port Louis Marina so we did a tour there and had a nice visit on both boats. We are going to enjoy the Grenada cruisers community for the next 10 days and do small "shut-down" jobs to prepare Blue Pearl for summer on the hard. Saw this sign on a restaurant door - thought we could have used it around our school. In 1978, we met Gary and Donna on the beach at Allen's Cay in the northern Exumas. For many years they would finish up in their respective schools in June, camp their way down to Florida and then set off for the summer to explore the Bahamas with their 2 kids in their 23 foot sloop. We didn't see them at all for the next 35 years but we exchanged Christmas cards, letters and then when Al Gore invented the internet we connected via email. So it was pretty cool to sail into Tyrell Bay a couple of days ago and see them again. They have been great hosts, showing us around the island, sharing their tips on what has worked for them and some of their favourite places to visit. They've spent their winters down here since '98 so they know their way around. We've been crawling around their boat, looking at all their systems and how Gary was able so squeeze a 40 gallon per hour water maker into a crevice near the engine. We are examining the possibility of installing a similar system on Blue Pearl - or at least a hose back to their boat so we can fill up when we need water. We were thinking of planning a reunion for 2048 but realized that we will likely be spending time with them next year as we enjoy the cruising area around Grenada, Carriacou, Union Island and the Tobago Cays. So it won't be another 35 years. Good!!! Mayreau is a place we will revisit, and hopefully bring guests. It is a gem of an island with beautiful anchorages, a great beach, smiling, helpful folks and a really cool little village. We sailed past Salt Whistle Bay - there is a Moorings site at nearby Canouan and so Salt Whistle is a popular first stop - but there were at least 30 boats in the tiny anchorage. Friends have said that it really is worth a stop so we will do that next year. Instead, we went another mile to Saline Bay and enjoyed screamin' internet, great holding and no roll. Great spot. Even the boat boys were enjoyable. Everything about Mayreau is third world - except their prices. A loaf of banana bread from the boat boy was $14 and croissants were $4 each. We had heard from other boaters that there are two T-shirt ladies on the beach. The "big" one, Rosie, is known for her benevolence. She has raised her own brood… and now "adopts" under-privileged kids from the island and nurtures and encourages them so that they can complete their schooling. Very noble. We had a bunch of baby clothes and diapers from grandkids' visits that we were able to leave with her. Also, had to buy a T-shirt for Glen! Robert Righteous and De Youth's Restaurant - getting too old - the music was too loud so we didn't go in. We heard from Bruce and Colleen on Serenity that they would be travelling from Bequia to Chatham Bay on Union Island so we made that our destination for Sunday. When we pulled in we were greated by the ubiquitous "boat boys." They are always there but we have yet to have a bad experience. Sometimes we buy their services, sometimes we don't. A "no thank you", usually seems to work. Had a great reunion with Colleen and Bruce and a lovely dinner on their boat. Glen was in excellent voice as he and Bruce entertained the lovely ladies. A good time was had by Glen. We are anchored off Ashton, Union Island and today took the bus into Clifton to clear customs, etc for our trip onward to Carriacou and Grenada. Tomorrow off for our reunion with Gary and Donna in Tyrell Bay, Carriacou. Met them 35 years ago at Allen's Cay in the Bahamas and kept in touch. Haven't seen them since. We bet they still look the same... just like us! We had a wild ride down from Marigot Bay on St Lucia to Bequia (Beck-way), part of St Vincent and the Grenadines. 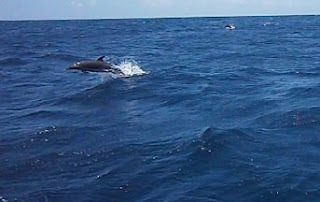 Enjoyed a spectacular interaction with a pod of dolphins - Pam saw one leap out of the air and do a flip! They must be a different species than the ones we we saw up north. They seem to be smaller and as they approached the boat they leaped high into the air. They look like they are having terrific fun racing up to the boat and riding the bow wave. It is VERY difficult to get a decent picture. The Bequia Regatta was this weekend so the harbour was full and the music was blaring. We met up with Bobby and Leslie on Gra'inne and headed over to watch the running start of the local sloop races. The wind was up so there was lots of excitement. We had a great meal at the Deckhouse, a new restaurant in Bequia, located where Daffodil's Marine Services used to be. We are anchored right off their dock so it was a quick trip for a fabulous meal with terrific service. Waiting for weather to head farther south; to Mayreau, Union Island, Carriacou and Grenada.